It can sometimes seem as if the problems between Chittenden County Transportation Authority drivers and managers are about much more than a contract. In picket lines and at public forums, drivers rage at bosses who they say don't listen and are bent on punishing hardworking employees. Meanwhile, at CCTA headquarters, managers have posted a security guard and barricaded the parking lot where drivers have maintained a constant picket during a strike now in its third week. At times the two sides couldn't agree on whose turn it was to make an offer. And, as it turns out, there were four days when talks — and 9,700 bus rides a day — were stalled due to nothing more than a lost message. On March 22, as the strike moved through its sixth day, CCTA offered the drivers' affiliate union, Teamsters local 597, a new contract proposal. There was just one problem, union steward Nate Bergeron told Seven Days — the drivers never saw the proposal in its final form. Instead, the transportation agency posted the offer on its website, as it has been doing with many press releases and negotiation documents. Drivers didn't learn of the package until the strike had moved deep into its second week, according to the stewards. "We had been picketing for nothing," Bergeron said. "We had been waiting for a response, and lo and behold the response had been posted on the website. We didn't know there was a counteroffer for four days. We left [the negotiations] and they had not given us their final proposal. After we walked out, the ball was still in their court." CCTA says the proposal was only slightly changed from an earlier draft, faulting union leaders for their own internal communication failures. The missing section was not discussed at the negotiating session, the agency said, and CCTA made the minor change only after notifying an official from the Teamsters. The change had to do with Article 6 of the contract, a section related to disciplinary policies. "The union expressed that unless we were willing to accept their proposal in Article 6 in whole, they were not interested in further discussion," CCTA spokesperson Meredith Birkett said in a statement. "So the CCTA team told the union team that our previous offer on Article 6, which they already had in writing, stood. So, because CCTA was not proposing any changes to our prior Article 6 offer, we did not reproduce it at the meeting. This was clearly communicated to the union team." On March 26, after seeing the full proposal online, union leaders huddled at Bergeron's home to mull the CCTA offer and craft a counteroffer of their own. It was that offer — which CCTA declared "credible" — that led to a resumption of talks. Between the emotional arguments and communication lapses lie the concrete issues dividing the parties. Negotiation teams seem to have resolved, or be close to resolving, two of them: compensation and the use of surveillance cameras on buses. But, as of press time, managers and the Teamsters remained stuck on two other issues: the length of driver workdays and the hiring of part-time drivers. At the core of the dispute is the way the workday is structured at CCTA and other public-transit agencies. Currently, drivers' schedules revolve around peak travel times during morning and evening commutes, leaving a lull of as many as five hours in between. As a result, many CCTA drivers work split shifts, with "spread times" capping the length of time between the start of their first route and the end of their last route. Drivers also don't have one designated route. After mapping out routes, CCTA packages them into bundles. Drivers "bid" for bundles four times a year, with senior drivers getting first pick. Two-thirds of the bundles promise 40 hours of work, but the rest do not. There are always a certain number of runs that cannot be bundled with other ones. Therefore, any driver who is short of 40 hours in his or her bundle must pick up one of those open runs. Additionally, many drivers end up working overtime — much of it voluntary, but some of it mandatory. Got all that it? Here is a look at the key remaining issues. The previous agreement between CCTA and its 70 full-time drivers expired last summer. Under that contract, a driver's maximum spread time was limited to 12.5 hours. 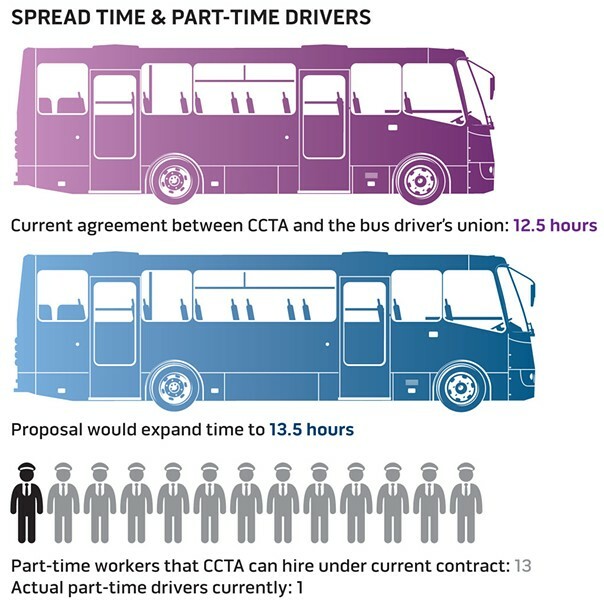 In 2012, before the most recent contract expired, CCTA had asked the drivers' union to expand that spread to 13.75 hours. Managers said it was the only way to adequately serve customers who are increasingly riding the bus only during morning and evening rush hours — especially as the nonprofit agency expands routes between Burlington and outlying communities. During negotiations for a new contract last summer, drivers agreed to a 13.5-hour spread. But after disputes arose on other issues, the drivers' union reversed course and said drivers don't want to go beyond the existing 12.5 hours. Why the change of heart? Union officials say they initially offered the 13.5-hour spread only as a concession. In return, they wanted CCTA to agree not to hire part-time drivers, who were seen as a threat to full-timers' job security. When management insisted on the part-timer flexibility, drivers resumed their complaint that a 13.5-hour workday creates an unacceptable level of fatigue and stress at home — and can create safety issues on the road. CCTA general manager Bill Watterson said that going to a 13.5-hour spread time would give the agency the flexibility to create more 40-hour bundles, providing stable hours to a larger group of drivers. He also says that the spread time is a fact of life at commuter bus agencies in other states, a point drivers readily concede. "We could create more 40-hour assignments ... 13.5 hours is being worked anyway, so isn't it better to schedule it?" said Watterson. Last weekend, CCTA management offered some movement: While holding firm on the 13.5-hour spread, officials said that no more than 20 percent of all drivers' shifts would include a spread that long. The drivers' response: No deal. "It's been working at 12.5 hours," Bergeron said. "They're not going to get everything they want. They have given nothing, and they have taken and taken and taken, and we're saying, 'We're done.' Give us the 12.5 hours — 12.5, we will sign." At this point, CCTA has only one part-time driver, despite a provision in the old contract allowing managers to hire as many as 13. Early in the negotiations, CCTA managers offered to drop that number to seven — but asked that the part-timers be allowed to work 25 hours, instead of 20. Throughout the negotiations, drivers consistently opposed an expansion in part-time drivers. They claimed that management was bent on diluting their ranks, crippling their union and reducing the number of solid, middle-class jobs. Full-time drivers at CCTA earn a base wage of $42,500 and can earn significantly more with overtime pay. An independent fact-finder brought in by both sides in hopes of resolving the impasse sided with the CCTA's proposed compromise. In hopes of moving beyond the current standoff, CCTA last weekend sweetened its offer slightly, asking for just five part-timers in the first year of the contract and up to seven in the following two years. And on Monday, the drivers signaled a shift in their position. In an interview, Bergeron said drivers would agree to allow CCTA an unlimited number of part-timers — but only if the agency agreed to the 12.5-hour spread. Bergeron said, "12.5-hour spread time, that's it." He continued, "The company wants to have its cake and eat it too. We say, 'No, you get one or the other.'" In a separate interview, Watterson said such an offer, if formally made, could serve as the foundation for an agreement. So does that mean balloons drop from the ceiling and the buses start rolling again? Not exactly. Remember that CCTA has only one part-timer, despite being allotted 13. Watterson said there's a reason for that, and he wants the drivers to agree to an additional compromise to make sure that situation changes. Per contract rules, part-timers aren't allowed to bid for routes in the way that full-timers can. Because part-timers are left with nothing but the undesirable leftover shifts, Watterson said, the agency has been unable to attract part-time drivers. He wants flexibility to allow part-timers to win attractive routes. "We can't attract people to take those seven part-time positions," Watterson said. "We need to be able to assign part-timers to work." "The [part-time] work rules are a nonissue," Bergeron said. Drivers are calling it an 11th-hour stalling tactic after they have yielded ground on many of their key demands, and a sign that management isn't interested in compromise. "For 10 months, the company has said we want part-timers. They never said we want them to be assigned. Once we agree to give, the company says, 'It's not that.'" And if the parties can't agree to rules on part-timers? Watterson said he'll continue to insist on a 13.5-hour spread time, which the union continues to say it won't agree to, no matter what. Despite loss of wages and benefits, drivers have unanimously rejected CCTA's two most recent offers. "Every time we vote, its unanimous, and they up the ante," Bergeron said Tuesday. "We're not getting paid, we have no health insurance, they're [considering] hiring scabs, and we're still picketing. We're committed."